Info "Perfect your timing to make the bar!" Track Star is one of Kat and Ana's microgames in WarioWare: Twisted! The game's purpose is to make the athlete jump over the bar. To do so, the player has to press when the end of the pole is aligned with the flashing blue part. If done so, the pole vaulter land\ safely. If the player misses, the pole vaulter goes flying off the screen. 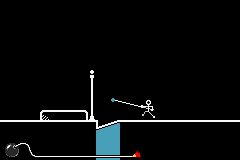 1st level difficulty: The bar and pole are both short, and the blue part is big and closely underneath the pole. 2nd level difficulty: The bar and pole are somewhat longer, and the blue part is slightly smaller and farther underneath the pole. 3rd level difficulty: The bar and pole are very tall, and the blue part is very small and very far underneath the pole. This page was last edited on September 26, 2018, at 22:56.